Notes And Updates: We no longer have an online parts catalogue. 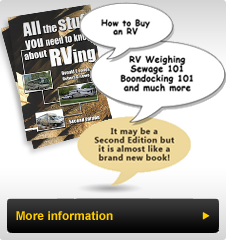 Check with your RV Dealer for suitable fittings and parts. In recent articles I have been previewing some of the new items available to use and improve our Bounder and in this issue I will discuss some new plumbing fittings and a remarkable corrosion blocking chemical. The plumbing connections and fittings on our Bounders have been changed over the last two or three years. If you make any new additions or have to replace a fitting, seek out the Sea Tech Inc. Quick Connect fittings at your RV dealer. Fleetwood has been using these fittings to connect the drinking water filter to the water system and to connect the icemaker and its shut off valve. I recently added a winterizing Tee and valve using these fittings. The process involved finding a suitable connection point in the water line more than 3” away from existing fittings. Simply use a hand held squeeze blade (tubing) cutter to cut the line, leaving a smooth mating surface. On each fitting, there are guides that show the insertion depth for the fitting so you can determine how much tubing must be removed. Cut the tubing again and slide in one end pressing on it until it seats. Install the other end by pushing it in. You can orientate the fitting in any direction; in fact it will rotate on the tubing under pressure without leaking. Within 10 minutes I had completed the task and all connections were leak free. The secret to these fittings is a patented "O” ring Guide inside each end of the fitting together with a sliding collet sleeve that when pressed in toward the fitting releases the water line. 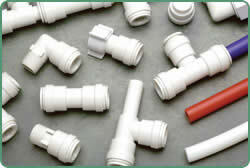 Since the lines can be removed so easily, this type of connector has replaced the drinking water filter connectors that have been standard equipment in Bounders for many years. These fittings are approved for use in all RV applications and are also in many housing applications using the larger tubing sizes. To see and read more go to pages 368-371 in our online catalog. Corrosion is a common problem we struggle with in all RV applications. We have relied upon di-electric grease to coat electrical connections and reduce corrosion. A new product that has been used in many other applications has recently been re-packaged in sizes suitable for RVers to use. 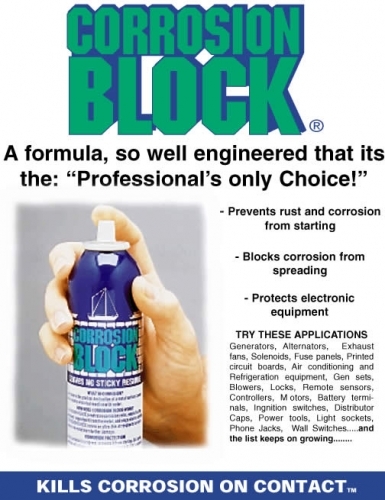 The product is called Corrosion Block and it is a liquid protector for hundreds of applications. If used on electrical connectors it will creep under wire insulation to provide a barrier to corrosion. It can be used on battery connections and it will last over one year. It comes in a hand pump spray, an environmentally friendly pressure spray and in a squeeze tube. Spray it in your door and cargo bin locks, on door hinges and trailer wiring connections and all electric circuit board connectors. This material provides surface protection and a barrier to corrosion as well as lubrication. I have been testing this chemical on a couple of Coach Battery connections on my 39Z. The Coach batteries get covered with road dust and debris in the rear location beside the engine. Di-electric grease attracts and holds this dust somewhat defeating the purpose of covering the connection. With Corrosion Block the connection is clean and dry and protected. Check out our website for more information.